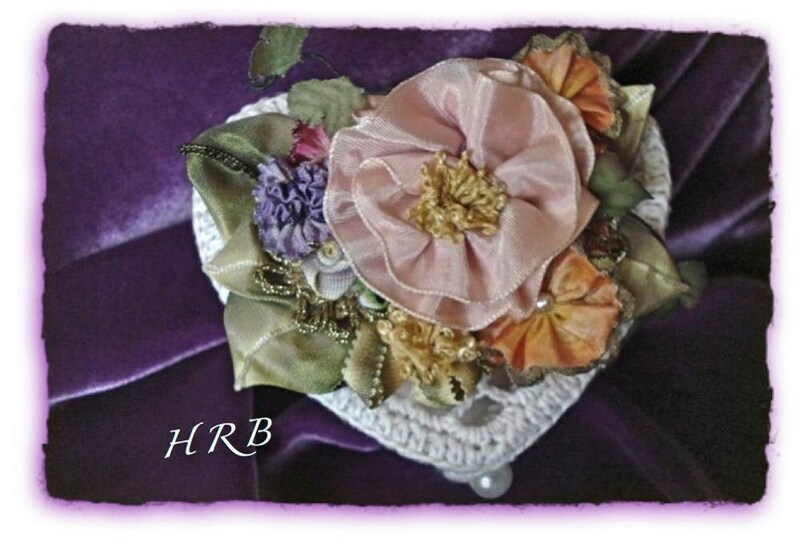 A romantic Edwardian/Victorian Heirloom for you dressing table. Perfect for rings and jewelry. 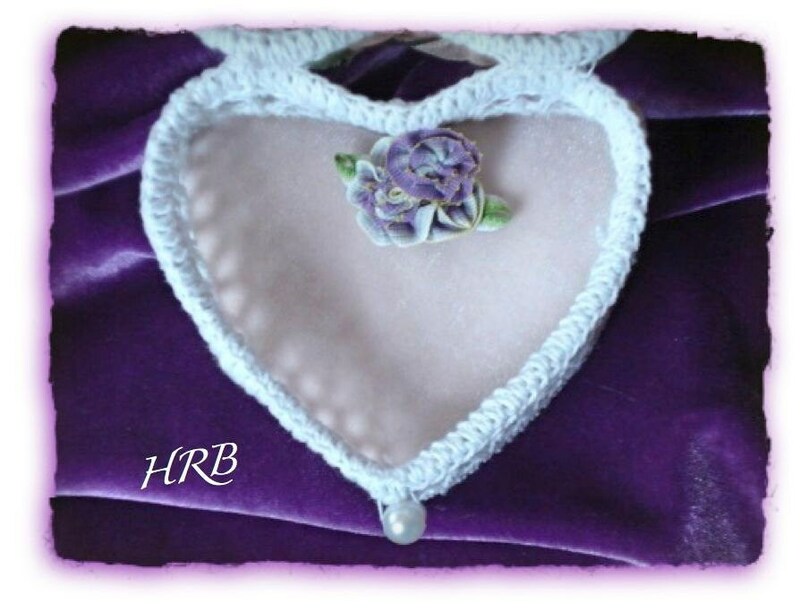 White crocheted heart shaped boudoir box with Deco style ribbonwork of vintage french ribboon. The inside is lined in pink velvet. The orange ribbon is from the 20's and edged in gold threads with a seed pearl center. The main pink flower's center is a vintage yellow gold picot ribbon. 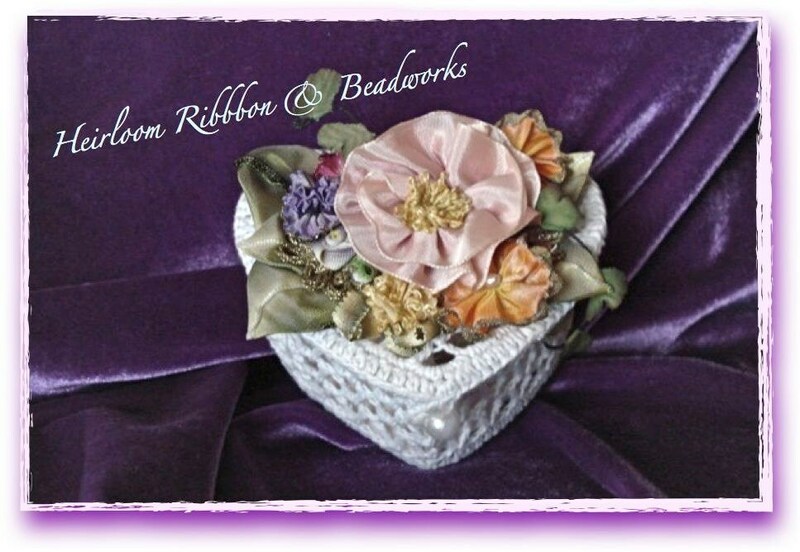 There is a purple variegated French ribbon with gold metallic threads as an accent flower. Light up your boudoir with this delicate and unique little treasure box. One of a kind. Feel free to contact me if you would like a custom made piece. I will be happy to create a new design or to restructure an old one with new color and texture. Convo me to discuss the endless possibilities. We ship USPS. These items require special packaging to prevent damage in shipping. We prefer to ship with insurance but it is optional and paid for by the buyer at time of shipping. We are not responsible for damages or lost items if insurance is not requested and paid for. International shipping charges, duty, taxes etc…is determined at time of purchase.